Despite a few high-profile disappearances, plenty of iOS apps have companion apps for the Apple Watch—but only some of them bring genuinely useful functions and features to your wrist. Here are our picks for the Apple Watch apps that go above and beyond the basics to add real value to your Apple-branded timepiece. Things comes with a high entry price, but as one of the best planners and to do list managers in the business, you might find it’s worth it—and it has an excellent Apple Watch app. Get your messy life organized and always know what you need to do next, right from your wrist. With dynamic notifications you can interact with, complications for watch faces, and an Apple Watch layout that’s both clear and informative, it really is a textbook example of how to do an Apple Watch app. Notes and commands can be dictated via voice, too. With the usual caveat about it only working in certain cities, Citymapper is a must for the Apple Watch. Using public transportatio is one scenario when a smartwatch can be genuinely preferable to a smartphone, and this app ticks all the boxes for getting you from A to B. It does much more than just extend the iOS app to your wrist—it offers complications for watch faces, it can nudge you when you need to get off whatever vehicle you’re on, and it works on LTE, so you can still get back home if you’ve forgotten your phone. For a running app to really earn a place on your wrist, what does it need? Phone-free operation? Check. Real-time feedback? Check. Quick glance information? Check again. Nike+ Run Club hits all the marks and then some. One of the most helpful features the app offers is voice guidance as you run, and you can even add pre-recorded cheers from your friends if you need an extra motivation boost. GPS tracking is included too, and the watch app includes a simplified look at your route maps. The Apple Watch doesn’t include a calculator by default, which is a shame considering it was one of the original “smart” functions introduced to watches way back when. Plug the gap with the PCalc app, which impresses whether you use it on an iPhone, iPad, or Apple Watch. You can access a ton of advanced features, like trigonometry calculations, right from your wrist, but the interface never feels cluttered—and it makes good use of the digital crown and voice control if you don’t want to stab at the watch screen with your fingers. The Apple Watch has proven itself a valuable health and fitness aid no matter which apps you do or don’t have installed, but Gymaholic goes above and beyond the basics to offer more than most—including animations showing you how to perform exercises. In other words, it completely removes the need to keep reaching for your phone when you should be concentrating on your muscle training. Everything from your heart rate to your training schedule appears on your wrist, and you can even control your music from it too. You really will feel like you’re in the future when someone is talking to you in a language you don’t understand, and you tap your Apple Watch to get an instant translation via iTranslate Converse. It doesn’t work perfectly every time, but it’s still fantastically useful. You can turn your own speech into the necessary foreign tongue too, with a total of 38 languages supported by the app, and transcripts of all your conversations saved to your phone. It can even pick up which language is being spoken automatically. App makers wanting to build a decent experience for the Apple Watch need look no further than Strava: it brings all the key features of the main app right to your wrist in a way that’s not overwhelming and which uses an approach specifically geared for the wearable. So you can start and stop workouts, see your vital statistics at a glance, get audio cues for your runs, and more right from your smartwatch. It works without a connected handset too, so you can log all of your activities without being weighed down by a phone. There’s no shortage of weather apps that work with the Apple Watch, but Carrot Weather stands out for its intuitive, concise interface, and of course, the attitude that Carrot apps are known for. This is an app that will actually laugh at you if you’re caught in the rain. The weather predictions are all as detailed and (usually) as accurate as you would hope for (data is pulled from Dark Sky), and then you get the added bonus of seeing everything that matters on your wrist (with complications support) in a format that’s very simple to follow. One of the coolest ways to use your Apple Watch is undoubtedly as a remote control for something else—it just feels so sci-fi, even if it isn’t really—and the VLC Mobile app for the wearable lets you control video or music playback on another device with a few taps. In addition to starting and stopping playback and adjusting volume, you can also bring up playlists and your entire media library, right from your wrist. So you could, for example, AirPlay a movie to your Apple TV and then control everything from your Apple Watch. 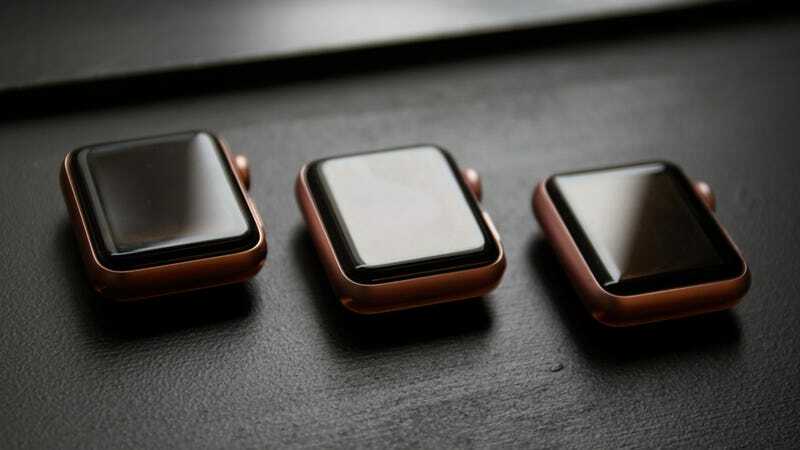 Smartwatches are, in part, intended to cut down the amount of time you have to spend hunting in a pocket or a bag for your smartphone, and Just Press Record is a perfect example of how this can work: If you need to record audio, just tap on your Apple Watch. And, well, that’s just about all there is to it. Your recordings can be synced back and replayed from your iPhone, and there’s even a transcription function included if you need it. The app lets you set up a Siri shortcut to start recordings using your voice, as well. Speaking of apps that are much more useful on your smartwatch than on your phone, here’s Shazam (now actually owned by Apple). You no doubt know the drill by now: You tap once on the app and it instantly identifies whatever song is playing around you. The Apple Watch app doesn’t really let you do much else but it scores top points for convenience. You can swipe through your previously recognized songs, as well as beam track titles over to your iPhone if you want to bring up the video or buy the music. What Apple Watch apps are your favorites? Let us know below.